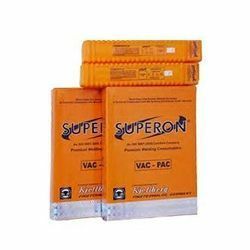 Leading Manufacturer of superon supercast nife electrodes from Vasai. Graphite basic coated electrode with a Ferro-Nickel alloy deposit for joining and repairing nodular cast iron. Deposit homogeneous and highly resistant against cracks. Particularly recommended for dissimilar welding of cast iron to steels and constructions of cast iron. Good bonding and flow of the weld metal. Defect in foundries, repairing of engine blocks, houses of tool machines, gearboxes, reducing parts, pump bodies, cast pieces, valve bodies. 1 Box of 10 Kgs contains 5 packets of 2kgs each. For more information please check technical data sheet attached below. Looking for Special Application Electrodes ?